This self-contained Daydream headset is mostly great, but who's it for? There's nothing quite like spring in New York. It's warm, but not too warm. Protests and open-air markets are spinning up at Union Square. The popsicle vendor next to the office is slinging treats while the heady aroma of kebabs from the food truck around the corner draws a crowd of lunchtime regulars. At long last, people are luxuriating outside, and New York feels alive again. Naturally, because the city was brimming with energy, I had no choice but to go outside and goof around with a VR headset. You see, Lenovo's Mirage Solo is part of a new breed of self-contained VR headsets. You don't need to connect it to a powerful PC or stick a phone inside of it. You just turn it on, pick up Google's classic Daydream controller and dive right in. While headsets like the Oculus Go are accessible because they're fairly cheap, Lenovo and Google were a little more ambitious. They needed to take the existing Daydream concept and make it more capable. By cooking up a way to help this all-in-one headset understand your movement in the real world and translate it into virtual ones, I'd argue they succeeded. Lenovo’s Mirage Solo is a new kind of self-contained VR headset, and despite some quirks it gets a lot right out of the gate. The addition of WorldSense motion tracking and some clever internal design touches make the Mirage a more powerful, more flexible option than alternatives like the Oculus Go. The strength of the first batch of WorldSense-compatible apps leaves us cautiously optimistic, too. The thing is, at $400 the Mirage Solo costs far more than entry-level headsets and about the same as higher-end tethered options like the Oculus Rift. With the Mirage, Lenovo and Google charted a new path, but it’s not clear right now who this is for. Be the first to review the Mirage Solo? It helps that Lenovo didn't have to design the Mirage to work with different kinds of phones — instead, it packed those smartphone components into the headset itself. Tucked away inside the Mirage's plasticky white body is a Qualcomm's Snapdragon 835 chipset, 4GB of RAM, 64GB of storage, a microSD slot and a 5.5-inch LCD screen. Basically, it's a flagship phone from 2017, just designed to be worn on your face. Lenovo did modify or rebuild some of the parts to perform a little better, though. Take that Snapdragon, for instance: It can run at higher speeds than normal when apps and games require extra power. The difference isn't massive, but it was sometimes noticeable when I compared the same apps on a phone inside a Daydream View headset. The addition of heatsinks toward the front of the headset meant the Mirage Solo was less prone to overheating under heavy loads, even when I took it outside to play games under that beautiful spring sun. It's obviously not as powerful as, say, an HTC Vive Pro tethered to a gaming PC, but those chipset tweaks and some impressive app designs mean the difference isn't as vast as one might assume. Lenovo and Google made a somewhat controversial decision in opting for LCD instead of OLED for the screen. OLED is more common in VR headsets because of its faster refresh and deeper blacks. But they do suffer from ghosting when there's lots of contrast in a scene. Lenovo's solution was to cook up a specialized LCD running at 2,560x1,440 (also known as QHD), and it worked. There's essentially no ghosting here. The flip side is that, while the screen is technically capable of refresh rates as high as 90Hz, Lenovo capped it at 75Hz so as not to burn through the battery too quickly. As it stands, one charge is generally been good for between 2.5 and three hours of use — I can't imagine how fast those figures would tank if the screen were updating 90 times a second. None of this would matter if the headset itself was too unwieldy to use, but thankfully that's not the case. I've found Lenovo's design extremely comfortable to wear for long periods of time, even when I'm wearing my massive hipster glasses. Rather than offer a tangle of elastic straps and call it a day, the company went with a solid plastic strap that wraps around your head like a crown. To get the headset feeling appropriately snug, you can twist a dial around back to adjust the circumference and press a button on the bottom of the headset to control how far forward you want the forehead plate to sit. Describing how one can adjust the headset just then was more awkward than actually using it. It never took me more than a few moments of fiddling before I found my sweet spot, and the headset never felt overly cumbersome. As with most devices meant to attach to your person, your experience might be different. I didn't notice any outside light leaking in around the edges, but a few colleagues with more reasonably sized heads struggled with that. Oh, and while the Mirage Solo might be my favorite headset to wear, its solid headstrap means it's far less portable than a Gear VR or Oculus Go. You could throw this thing in a backpack and whip it out on a plane, but it'll take up so much space in your bag that it's almost not worth it. Of course, this headset is as important (and as expensive) as it is because of its WorldSense tracking technology. 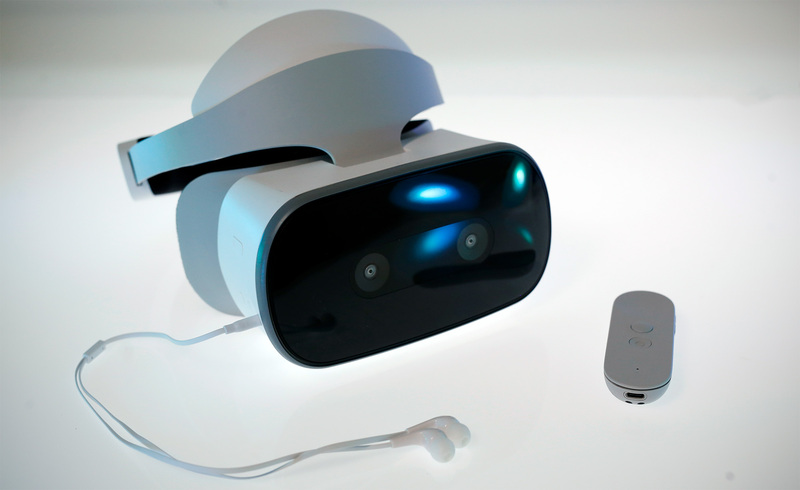 Baked into the front of the headset are two cameras that, combined with a set of rotational sensors inside the headset, provide true 6-degrees-of-freedom movement in whatever apps support it. Put another way, you're not limited to simply looking around the world the way you would with something like an Oculus Go — you can physically bob, weave, step into and slink out of virtual environments. There are no external sensors involved, and no closed off spaces required. For the most part, it just works — albeit with some limitations. Exactly how much you'll get to wander is up to Google and Daydream developers, though most apps won't let you move around for more than a few feet before reminding you to take a step back "into the experience." And since the pack-in Daydream controller only supports three degrees of freedom compared to the headset's six, I often experienced a sort of physical disconnect because I could maneuver my "body" inside some virtual environments in ways the controller couldn't. You'll look like a goofball using the Mirage Solo outside, but it performs well under the hot sun. It can feel limited at times, but WorldSense tracking is a huge addition to mobile VR, and I hope it doesn't take too long to become the rule instead of the exception. In the meantime, though, we're left with a big question: will developers actually bother building new experiences for WorldSense? It's tough to say, but Google is off to a pretty good start. Of the roughly 350 Daydream apps available, I'm told around 40 will be updated with WorldSense support by the time you can buy a Mirage Solo. Google engineers also told me that adapting some existing Daydream apps to work with WorldSense could be as simple as toggling a setting. It'll obviously take time for WorldSense to pick up traction (or, you know, fail completely), but some of the initial experiences for it are a blast. The most impressive by far as been Blade Runner: Revelations, a Daydream exclusive that puts you smack in the middle of a futuristic, neo-noir Los Angeles. It starts off by putting you in the seat of a flying car called a spinner, and I spent the first few minutes crouching, stepping side to side and craning my neck to take in every little detail of the spinner's interior and the aerial views of LA. Then you're dropped into a tense, vibrant back alley and you're left to start your investigation. And then there's Rez: Infinite, a port of a rerelease of one of my favorite games of all time. I'd sound like an idiot trying to explain the story, but it's an on-rails shooter that blends absurdly trippy visuals and joyous musicality in a way that feels truly special in VR. I might've looked like an idiot playing it outside, sure, but I frankly couldn't care less. If other developers commit to crafting experiences as fun and as visually arresting as these, then Daydream's future as a VR platform has a lot of potential. As much as I've enjoyed my time with the Mirage Solo, I've had a hard time figuring out exactly who it's for. The $400 price means it isn't as attractive to VR newcomers as a phone-based Gear VR or Daydream View. On the other end of the spectrum are the VR diehards, people who already have pricey gaming PCs and don't balk at the cost of an Oculus Rift or an HTC Vive Pro. In a way, the Mirage Solo exists in a sort of middle ground that few major companies have made much progress in yet — the self-contained Oculus Santa Cruz isn't on sale yet, and HTC's Vive Focus is only available in China for now. As a result, the Mirage Solo feels like an option for a very specific kind of VR fan: someone who values flexibility but doesn't want to compromise on power too much. That's a weird slice of the VR market to be sure, but for them, there might not be a better choice.